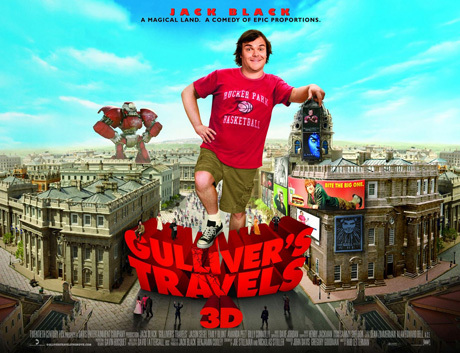 Most people are in agreement that Gulliver’s Travels 3D is an insult to Jonathan Swift and is definitely going to be terrible (I actually chuckled limply at one point in the trailer so I’m reserving judgement). One thing I’m much more upset about is the fact that Hollywood still thinks it’s funny to do ‘brand puns’. Ever since Shrek 2 decided it would be hilarious to redesign the Gap logo to say ‘Gap Queen’ (I’m laughing just thinking about it), brand-based puns have been a surefire shortcut to LOLs, everywhere from Shark Tale to Cars. This isn’t a specific brand per se; in fact, it isn’t advertising anything except burgers and drinks in general. And what is the big one? Actually, I don’t want to know. This might be an iPod spoof. I hope it is, because they. are. brilliant. Remember that film Avatar that came out last year? Well imagine how hilarious it would be if that were changed to Gavatar (because his name begins a ‘G’ – NOW DO YOU SEE?) and we did some photoshoppings on Jack Black’s face to make him look like a Na’vi. That’s satire, that’s what that is. Even TV shows aren’t safe from the global dominance of Gulliver! Just imagine what hysterical alternate title they came up with for Glee! What’s that? Glee? Brilliant! I don’t even slightly know what this is.